Friday 12th August 2016 is National Blood Bike Awareness Day. Blood bikes are the silent emergency service, transporting blood for blood transfusions, injuries and emergency responses for emergency services, the NHS and other medical services. These unsung heroes are all volunteers. 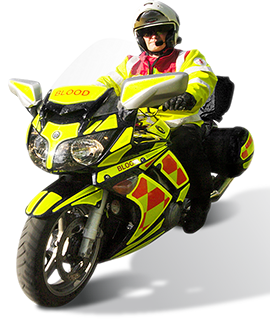 Blood Bike Awareness Day is organised by the National Association of Blood Bikes (NABB) and aims to promote awareness of the lifesaving work the NABB does in conjunction with the NHS and emergency services. Blood Bikers are the 1,500 men and women all over Britain who provide an out-of-hours rapid response courier service as well as transporting hospital deliveries across the country. The Blood Bikers are all volunteers, and in 2014 they responded to around 39,000 urgent requests from hospitals, saving the NHS hundreds of thousands of pounds. Every night, expert motorcyclists with the word “BLOOD” written on their reflective jackets speed from hospital to hospital in the United Kingdom to pick up and deliver emergency medical supplies. By day they are electricians, lawyers, priests, and pilots, but by night they are the Blood Bikers. More than 1,500 volunteers provide coast-to-coast coverage, carrying everything from blood, platelets, and plasma to breast milk, vaccines, and surgical equipment.